The 6th, 7th and 8th of December will take place at the municipal sports center of Gandia the competition seminar of Kendo and the 1st International Trophy City of Gandia. The organization of this event was made possible thanks to the cooperation of the City of Gandia (Servei Sports Gandia), who has provided the necessary support for its execution. On December 6th and 7th will take place the competition kendo seminar leaded by NAOKI EIGA (8th Dan – Japanese Champion and World Champion in 2003) and AKINORI IWAHASHI (7th Dan). The competition will play on Sunday, December 8th from 9.00am, in the manner of equipment (3 competitors), individual male and individual female. It will involve at least one confirmed Italian team headed by Fabrizio Mandia, a team headed by Sandor Hungarian Dubi, and several teams with members of the Spanish national team. On September 23 th will open the registration period. Registration will take place in strict order of entry. Places are limited, so that once exceeded the limit set will open a waiting list for possible last minute low. The course registration shall be paid on a pack with the accommodation spends (hotel + food + course) as the only alternative, because this is one of the conditions imposed by the government of the City of Gandia to provide support. Since the course will be focused on the competition, and although there is no inscription to dimension, we recommend a minimum of 1º KYU for course and competition participants. The entrance to the pavilion will be free. 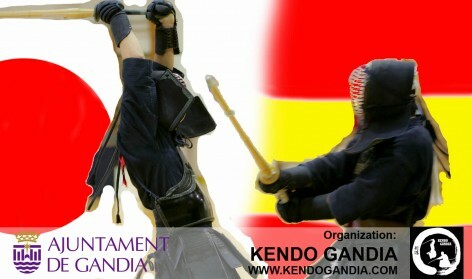 All kind of inquiries will be met through Facebook or kendo club Gandia website. From the airport take the line L5 at Valencia subway, service from 5:30 to 23:00. Until Xativa stop, in the center of the city, it´s about 20 minutes ride. You’ll come out in front of the North Station (Railways RENFE). You have to go across the station, at the beginning are long-distance lines, but must go to the end at the right side, at suburban train platforms. Take the line C1, there is a train to Gandia every half an hour from 6:00 until 22:30 hours, the journey is about 50 minutes. SEMINAR SCHEDULE AND COMPETITION DETAILS.